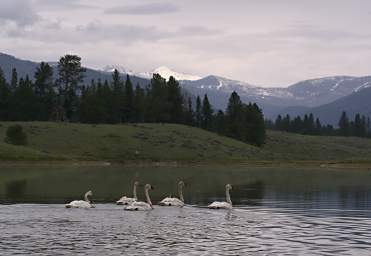 Prior to settlement by Americans of European descent, the Blackfoot Valley was home to Trumpeter Swans. 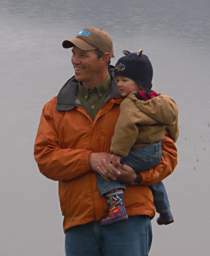 Through hunting for food and for feathers for hats, they became locally extinct. Then, in 2003, a pair of trumpeters showed up on a pond owned by the Bouma family near Lincoln. They nested and had four eggs, but the female of the pair was killed when she flew into a power line. The eggs were transferred to the Montana Waterfowl Foundation and substituted in a nest of surrogate parents. 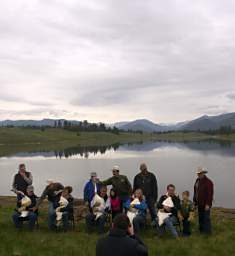 Three of the eggs hatched, and after partial rearing by their surrogate parents, the three signets were moved back to the Bouma pond where the male was still resident. In the fall, all four birds left for the winter. 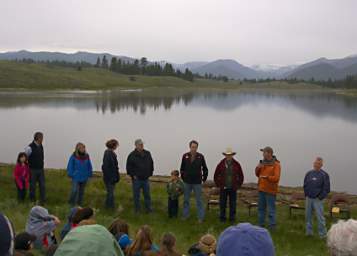 In 2005, the Blackfoot Challenge, the U.S. 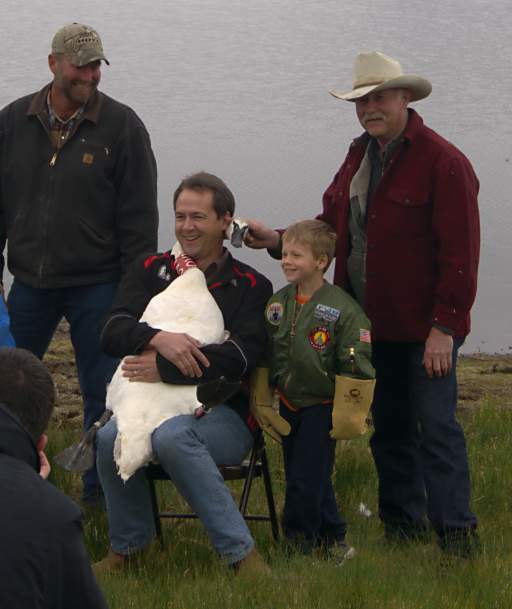 Fish and Wildlife Service, the Wyoming Wetlands Society, and the Montana Department of Fish, Wildlife and Parks collaborated to begin a program to reintroduce swans to the Blackfoot Valley. 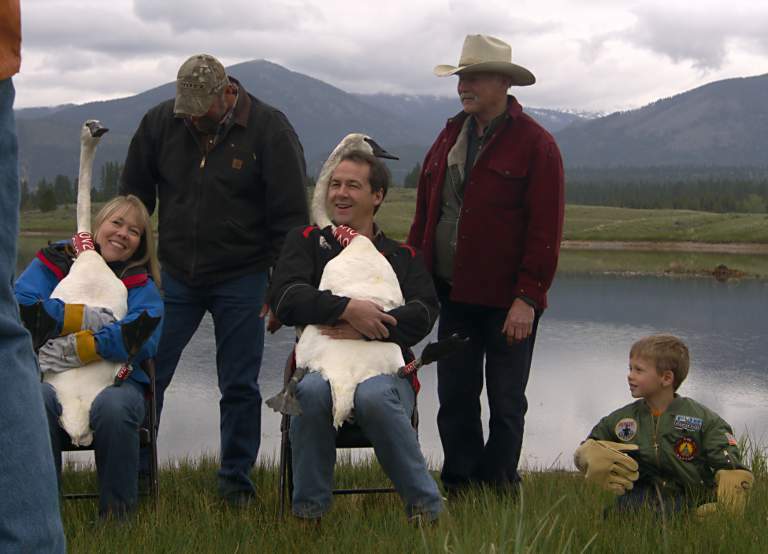 That first year, ten young swans were captured and transplanted to the Blackfoot Valley. 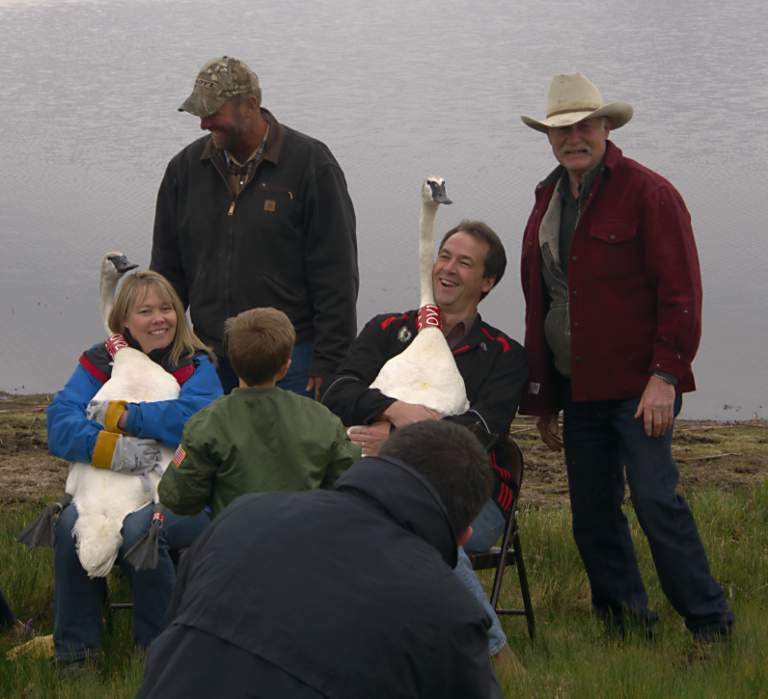 Unlike many other birds which develop an allegiance to the place where they are born, swans develop an allegiance to the place where they fledge, or first take flight. The hope was that by introducing young birds which would fledge in the area, the local population could be re-established. In the years since, additional swans have been released. 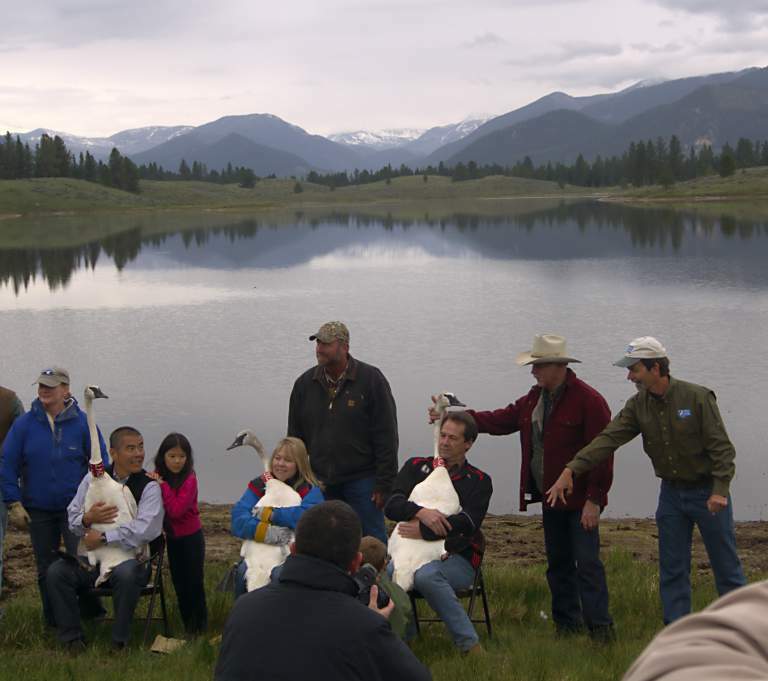 The birds began returning to the Blackfoot Valley, and in 2011, for the first time in many, many years, trumpeter swans successfully nested in the Blackfoot Valley. 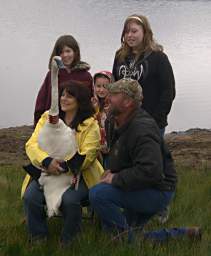 The program has continued, and this year another seven young swans were released. 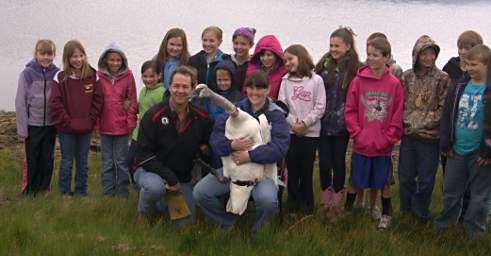 Five local schools took part; each school has "adopted" a swan which they can track as part of their classroom activities. 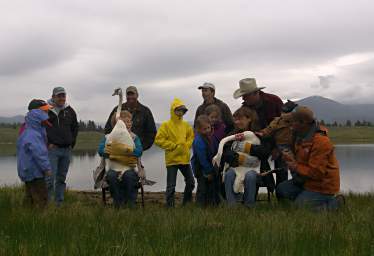 The teachers of those five classes were some of the privileged few, and got to hold their class's swan prior to release. In addition, the students were able to take part in an outdoor education program put together by Elaine Caton which hopefully will spark their interest in the natural world. The event was also attended by staff and dignitaries of the partners involved in the program, as well as the governor. 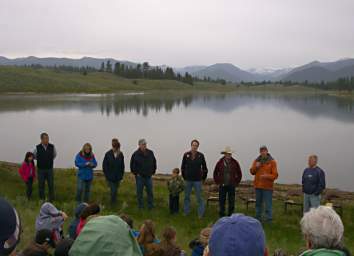 Jim Stone, Executive Director of the Blackfoot Challenge, gave introductory remarks. Greg Neudecker, the U.S. Fish and Wildlife Service lead on the swan reintroduction project, explained the swans' life history and the reintroduction program. 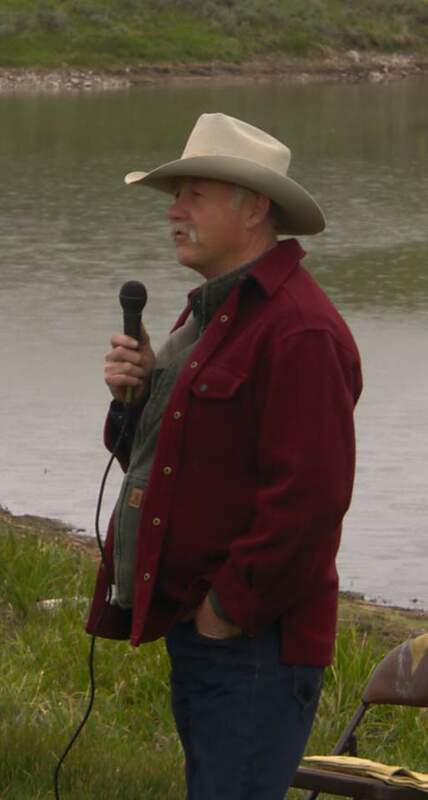 Louie Bouma described the first swans and their difficult time. 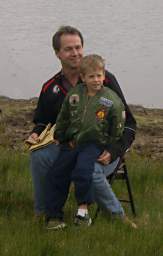 It is a captivating story, and he is a good story-teller. 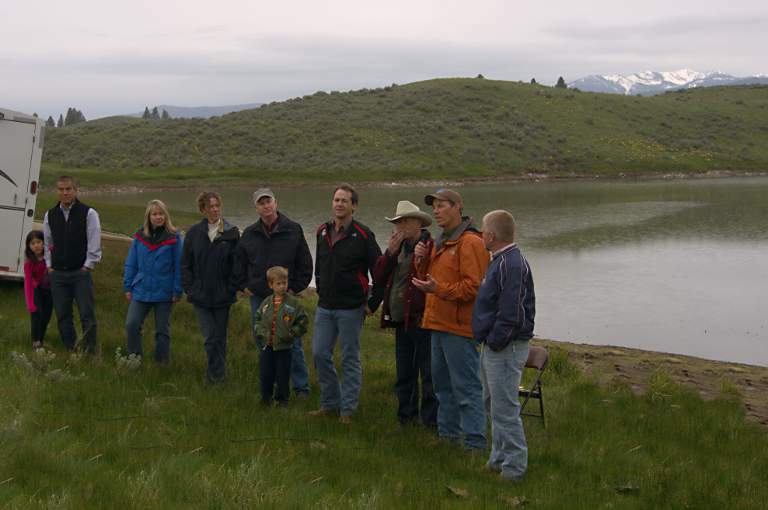 You can see the pond where those first swans reappeared at the Bouma Post Yard just east of Lincoln, MT, on highway 200. 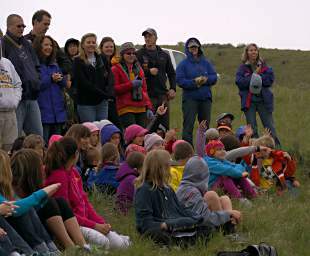 After Louie's inspiring story, the representative from each of the agencies participating in the program this year gave a quick run-down on what their agency does and answered questions from the kids. It was clear the kids had learned a little about the agencies before-hand, as they had some pretty good questions. 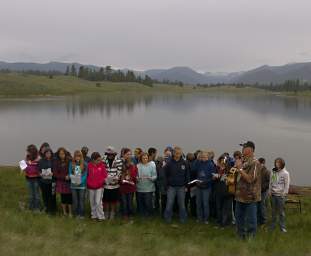 Jack Gladstone, a Blackfeet singer and songwriter, led the Seeley Lake 7th and 8th graders in a song celebrating the natural world. 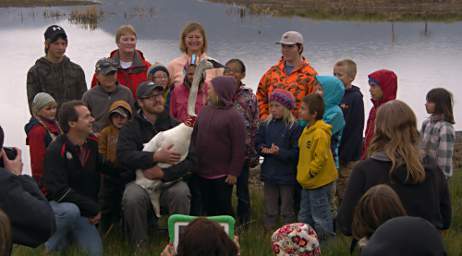 Then each of the schools gathered with one of their teachers and their swan was brought out. 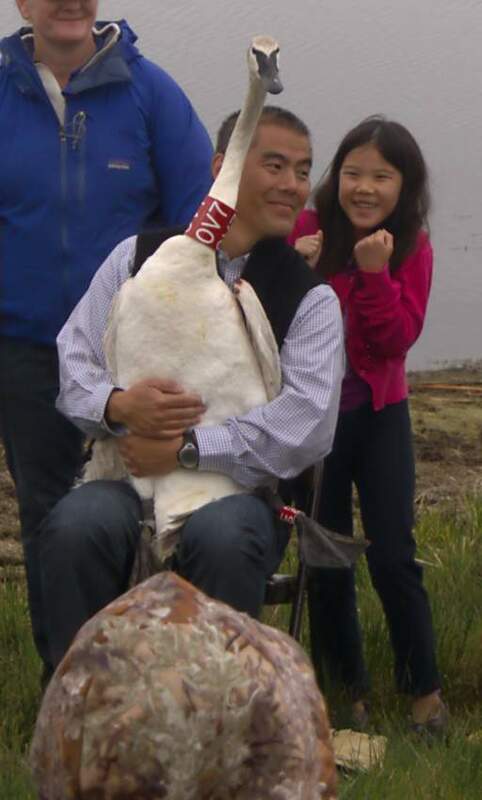 The teachers were seated, so that the swan could be placed in the teacher's lap. After posing for photos, the swans were transferred to one of the partner representatives who would be releasing the swan. As with many Blackfoot Valley events, some of the speakers brought their kids along; they got a real treat seeing the swans up close. 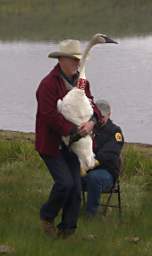 After posing for more pictures, the partner representatives carried their swans to the water's edge and on the count of three, opened their arms and released them. And then they were on their own! 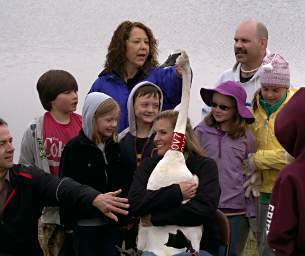 In addition to the school kids, a drawing was held from people who had donated to support the swan program this year. 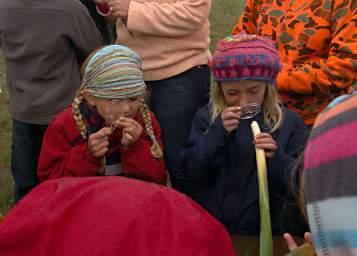 The two winners had the priviledge of releasing the last two swans. Deb Dilree and Heather Graham were the lucky winners. 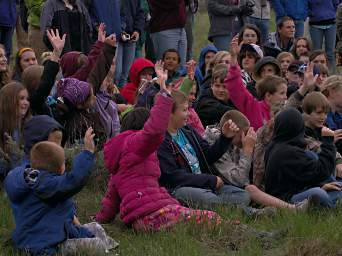 After the swans were released, the dignitaries left and the kids got a chance to have some hands-on education about nature. Wow! That was a fun time! This page last updated on 2015-01-13.